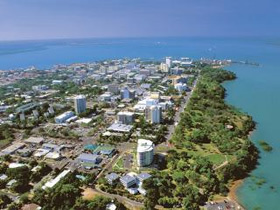 Australia’s only tropical capital city, Darwin boasts a unique flavour unlike anywhere else in the country. Enjoying expansive views of the Timor Sea, Darwin’s cosmopolitan beat blends indigenous culture with those of the other 50 nationalities who reside in the city. Subsequently this tropical town thrives on its diverse mix of restaurants, arts projects, museums and galleries (all in close proximity to myriad Darwin accommodation options). Quintessentially Australian, Darwin celebrates its spectacular surrounds (including the Kakadu and Litchfield National Parks) and tropical climate with a multitude of outdoor markets through the dry season and long weekends fishing off the Tiwi Islands for barramundi. Darwin accommodation is as diverse as the city that hosts it, offering everything from 5 star hotels to outback resorts and self-catered cabins. In the CBD, central hotels and serviced apartments offer a stylish and comfortable experience. For those who've have spent a few days (or weeks) out bush, accommodation in Darwin is perfectly situated to recoup and freshen up. Views across the city esplanade or Timor Sea offer spectacular sites while other apartments sit in walking distance from the famous Mindil Beach Sunset markets, public swimming lagoons and world class museums. Travellers staying within the city are highly encouraged to eat out at one of the remarkable restaurants, featuring cuisines from around the world. Guests who'd prefer to eat in can do so at one of the many self-catered apartments available through the city - perfect for families or travellers seeking a low key stay in the regional hub. Value travellers will find comfortable motels and cabins situated around Darwin, offering everything one needs to freshen up and sleep well. On the other side of the market, luxury resorts and waterfront hotels are in abundance in this tropical city.